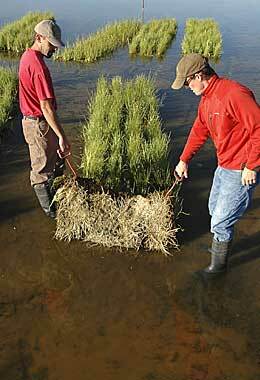 Wetland Sod is an instant way to establish native vegetation on shorelines and stream banks. It is a mix of coir erosion control matting and wetland plants grown hydroponically to maximize root growth for immediate anchoring and improved soil cohesion. Assuming the appropriate hydrology, Wetland Sod can be rolled out on any wetland or riparian site to provide immediate aesthetics, soil stabilization and weed suppression. The mature plants found in Wetland Sod have minimal soil requirements and can tolerate fluctuating water levels in just a few weeks. Wetland Sod is quick and easy to install, simply roll it out and stake in place.